Connect with everyone effortless and risk-free with ZTE’s newest phone models now available at Lazada.com.ph! 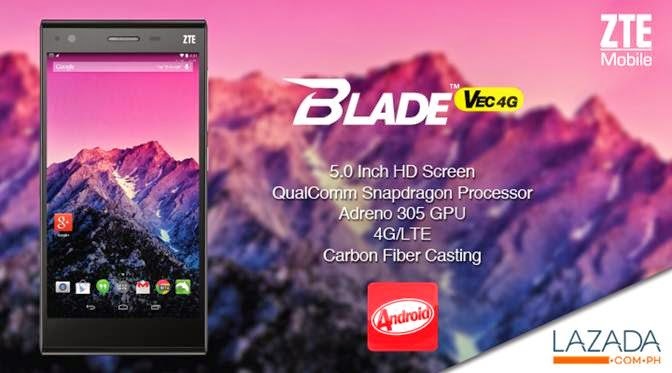 ZTE offers more value-for-money smartphones for everyone with it’s Blade Vec 4G, Blade Vec Pro, and Nubia Z5 S Mini. If you are looking to amp up your smartphone experience, ZTE has definitely has something exciting in-store for you and it will let you connect with everyone effortless and risk-free. This season, ZTE is offering a trifecta of superior product quality, performance, and sleek design – all built to whet your tech appetites. Together with the Philippines’ Biggest Online Shopping Mall – www.lazada.com.ph, its but fitting to note that these exciting new models from ZTE will cater to each and everyone who seek performance, sophistication, or being a cut above the rest. Should you wish to check the latest deals and offers on these exciting models from ZTE, simply log on to www.lazada.com.ph/ZTE. Powered by cutting edge 4G-LTE connectivity, the Blade Vec 4G is definitely set to impress you with its blazing fast downloads, seamless music and video streaming, and hassle-free video calls! Spend less time waiting for your favorite songs or series to download or stream, and spend more time enjoying while listening to them! Enjoy seamless toggling between content-rich apps, HD display resolutions, and optimal frame rates for graphic intensive 3D games with the Blade Vec 4G’s 1.25 GHz Quad-Core processor. Enjoy crisp and clear imaging capabilities with the Blade Vec 4G’s 5 inch display which offers an exceptional viewing experience, producing incredibly vivid shades and hues that can be enjoyed from any angle. And with its built-in support for Dolby Digital Plus, the Blade Vec 4G is your fitting pick for watching a video or browsing photos in social media with your friends. While the Blade Vec 4G boasts its sleek performance and formidable performance, it also offers hands-free functionality as it can event text a message, get directions, or even play a song – perfect for those busy days or while you are on the road driving. Its ergonomic design is also something that cannot be overlooked! The Blaze Vec 4G is built for the active lifestyle by featuring a sleek profile of meticulously crafted carbon fiber case and intuitively positioned buttons. It’s definitely sleek, durable, and comfortable to hold, with its well-defined edges which makes it also light on the pocket. 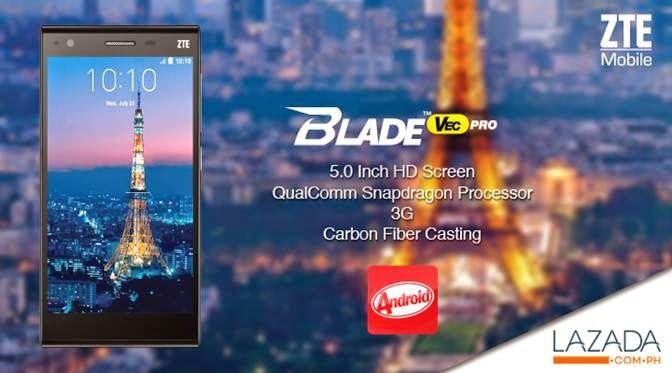 The Blade Vec Pro is all class – and more! Housed in a slim and durable carbon fiber case, it offers a comfortable hold and sleek feel. At such a thin build of only 7.5 mm, it’s surprisingly durable and easy at the hands. The buttons are intuitively placed for ease of use and enhanced mobile productivity. And it's still light enough not to tug down on your pockets. While the screen looks elegant at its size, it offers so much more. The 5 inch multi-touch HD screen is perfect for entertainment on the go. It's ideal for playing movies, streaming videos and toggling between applications. Images come alive with crisp details highlighting vivid hues and tints. The In-Plane Display Switching (IPS) Technology provides a better viewing experience by producing accurate colors for a superb entertainment that can be enjoyed from any angle. Complementing the massive display is the true Octa-Core power delivered by the MediaTek MTK6592 processor, seamlessly fueling the Android 4.4 Kitkat OS and other essential features. Run apps, browse the web and play high definition movies in a snap, without worrying of lags and glitches. Unlike other Octa-Core processors found on other devices, Blade Vec Pro's 1.4 GHz Octa-Core processor combines performance and efficiency by spreading load over eight independent cores to run even the most demanding apps and runs on a single core while powering down the rest when running lightweight tasks, giving you just the right amount of power exactly when you need it while stretching your battery life to the max. Snapping lifelike images and recording full HD videos is made easier with Blade Vec Pro's powerful cameras. Both the 13 MP main and 5 MP secondary cameras pack a stunning f/2.2 aperture opening and back-illuminated sensors (BSI) for capturing high quality images even in high speed and low lighting conditions. The main camera delivers vibrant shots while the front camera is best suited for capturing self-portraits and clips for video calls. The Nubia Z5 S Mini is a smartphone with a personality. Make a statement and reveal your personality with the nubia Z5 S Mini. It’s the world’s first smartphone to pack a 13 inch front camera that incorporates the control and photographic fidelity of a DSLR camera and lightning-speed 4G support. While Nubia Z5 S Mini looks stunning, its cameras are head turners of their own. The 13 megapixel front camera, equipped with 5-piece sapphire precision optical lens and Exmor RS sensor religiously retains image sharpness and authentic details. They’re also hard enough to resist scratches that come with snapping pictures on the go. In intense light, the blue glass composite IR filter delivers a remarkable balance of glare and clarity to give you vibrant images with stunning colors while the BSI image sensor and F2.2 aperture captures smooth, stunning images even in the dark. The rear camera comes with pro, fun, and auto shooting modes to give you the best pictures whatever the condition, or your mood is. The Pro mode is equipped independent controls for focus, lighting and white balance while fun mode gives you more ways to get creative with your photos, with features including multi-exposure, animated video, moving object removal, time-lapse, panorama, special effects and movement tracking. The auto-mode detects shooting conditions and snaps the shot you want. It also comes HDR and Self-timer options. Say goodbye to dark, blurry selfies with the whopping 5 megapixel front camera, equipped with a BSI sensor and F2.2 aperture to retain details and true-to life colors. The front camera also comes with a smile recognition feature for easy, auto selfies. Enhance the quality of your selfies with the built in photo editor with skin rendering and scale adjustment features for upload ready shots. The Qualcomm® Snapdragon™ 400 processor’s all-in-one design makes way for efficient multitasking, extending the 2000 mAh battery's power for longer. It also powers the cutting edge Sharp IGZO OGS display technology that delivers clear, crisp images and exceptional power efficiency. The 4.7 inch 720x1280p HD screen brings images to life with 16.7M colors, rendering an astonishing range of deep, intense colors, gentle hues and daubs of light. From simple pictures to high definition videos and graphic heavy games, details stand out and image clarity is crisp. 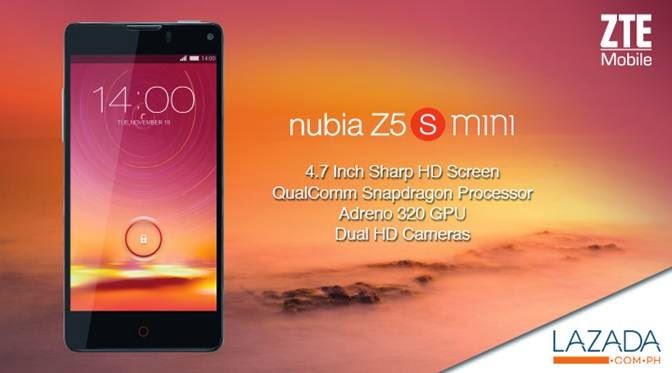 Nubia Z5 S mini’s 1.2 GHz Quad-Core processor has a maximum clock speed of 1.2 Ghz, backed by 1 GB RAM and 16 GB ROM, expandable up to 32 GB via Micro SD storage. Housed in a premium shell with matte finish, the Nubia Z5 S Mini feels smooth and good to hold. At only 7.6 mm thick, it joins the ranks of slim and sleek designed models in the market. The seamless sides elegantly extend to the meticulously curved edges. Overall, it's a fusion of style and function, with the buttons ergonomically positioned just within the tips of the fingers for ease of use. For all the sophistication, the Nubia Z5 S mini only weights at 120g. With built in 4G-LTE support, Nubia Z5 S mini is designed for the fast paced lifestyle. Say goodbye to lags as it supports faster data transfer, excellent network response and seamless connectivity. Share your captured moments, listen to music and stream high definition videos without a hitch. Download files with speeds of up to 150 Mbps and be entertained on the move. Pinoy Metro Geek: Connect with everyone effortless and risk-free with ZTE’s newest phone models now available at Lazada.com.ph!